We’ll start at the very beginning and cover all the terms you might encounter when discussing RAID. There are some terrific concepts here, so stick with it and remember that you will ultimately benefit with faster speed or safer data storage or both, and you will understand the trade-offs and how to describe your requirements. We hope you enjoy this guide. Our day job is recovering data from RAID systems and drives – if you need our assistance, call us on 0800 999 4447 or get in touch using the contact form on the left. RAID is an acronym that stands for Redundant Array of Independent Disks. So with “redundancy” built-in you might assume you will never need Data Recovery or back-ups – wrong! RAID refers to a storage volume composed of multiple discrete hard drives and defines the manner in which the collection is presented to the outside world (typically your PC or Mac). The hard drives used are usually standard off the shelf S-ATA, IDE, SAS or SCSI drives. Typically the hard drives will plug into some form of controller which will implement the configuration. A card within a PC which the hard drives plug into. Within an external hard drive (where the external houses more than one internal hard drive). For example the Lacie BigDisk is a 1TB capacity external drive comprising two internal 500GB drives. A stand-alone enclosure, usual within an industrial/commercial environment. Why would I want RAID? For speed of operation, you want to minimize the access time. For data redundancy, if any one drive fails you want to be able to continue operating without loss of data. These reasons are unrelated and yet the term RAID is applied to both. The most common configurations for domestic users are referred to as RAID0 and RAID1. RAID 1 provides redundancy but has the penalty of delayed access times. For RAID usage in commercial applications (and even in some domestic situations too) a commonly used combination of the need for speed and redundancy is the RAID5 implementation. Many externals sold now house 2 hard drives internally and on the first power-up you as the user will be asked how you want to configure them. A typical scenario is a 1TB external drive composed of 2 x 500GB drives. The setup software will ask if you want to configure these as RAID0 (striped) or RAID1 (mirrored). The implications of this choice must be understood . You may now already have enough to nod knowledgeably in meetings where RAID is discussed! Be aware that we get more technical from this point, so grab a cup of coffee and bookmark this page if you get interrupted. What happens within a RAID controller? This is designed for speed, it does not provide any redundancy, if one of the hard drives in the array fails then you have lost your data. Take the example of a RAID 0 array composed of 2 hard drives. Data that is written to this storage volume will be split between the two. The reason, as stated, is for speed. In a RAID0 array the data is presented simultaneously from the 2 drives through the controller to your PC or Mac. The controller will read/write a certain amount of data from/to the first drive and the same amount from/to the second, then back to the first and so on. The amount of data written or read each time is constant for any given array and is referred to as the stripe size. Typical stripe sizes are in the order of tens to hundreds of KB. If (for example) your RAID0 array has a stripe size of 64KB and you write a 100KB document to it then it must exist partly on one drive and partly on the second. From this it can be seen that if one of the drives in a RAID0 array fails every file which was in part stored on the failed drive has been at best severely damaged. You will still find some files that are both smaller than 64KB and are fortunate enough not to have been stored across a stripe boundary but these are typically small in number and tough to find because the operating system will certainly be in a mess. From a recovery point of view, with a RAID0 you must have access one way or another to all members of the array. If this is not the case then the loss of data will be very high if not complete. Also referred to as a “mirror” this is designed purely for redundancy. The contents of one half of the storage volume is identical to the other. 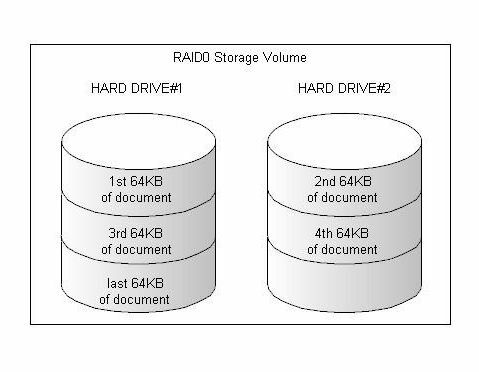 Typically a RAID 1 will be composed of 2 identical capacity hard drives, each time data is written it is written to both hard drives, there is no striping, the data is simply written twice. This of course takes longer but should one half fail there is no loss of data. This is designed primarily for redundancy rather than speed and requires a minimum of three hard drives. Just as with RAID0 the data is striped across the hard drives which make up the RAID array, however with a RAID 5 configuration if any single hard drive within the array fails then the volume will continue to operate (in all probability users would not notice that anything had happened), this is possible because a portion of the storage volume is dedicated to parity. Parity is information additional to the user data. It is created by the RAID controller and allows it to reconstruct the user data if one of the hard drive fails. If you lose any one of the user values you know what it was because you know what all 4 values added up to. This is essentially how parity within RAID5 operates. In this RAID5 example the stripe size is 64KB and the volume is spread across 5 individual hard drives. The row#1 parity information allows the controller to reconstruct the data if any one of the 1st, 2nd, 3rd or 4th 64KB stripe of the document file is lost. Similarly the row#2 parity information allows the controller to reconstruct the data if any one of the 5th stripe of the document or the 1st, 2nd or 3rd 64KB stripe of the photograph is lost. A RAID5 need not have 5 hard drives, it has a minimum of 3 but it can have many more. RAIDs composed of 12 are common (in that case there would be 11 stripes of data and 1 stripe of parity). If any one of the 12 stripes is lost then the controller can reconstruct the missing stripe. If a single drive is lost within the array you can keep working with the data because the controller can calculate what the missing data was. If more than one hard drive within the array fails then it is no longer possible to recover the user data (imagine 2 of the numerical values in the previous example being lost- you know the sum of all 4 values but now that 2 have been lost you cannot know the original values stored). Since a proportion of the RAID volume is given over to storage of parity rather than user data then there must be some loss of storage space. To address this last point, the parity used in a RAID5 volume is not in fact a simple summing of user data it is much more efficient in terms of storage space required. For each row of stripes across all of the members of the RAID5 array, one of those stripes must be parity, therefore in terms of space one of the drives will be given over to parity while all the others will be used for user data. Therefore a 4 drive RAID 5 composed of four 250GB hard disks will provide a user storage space of 750GB (3 quarters for user data and 1 quarter, i.e. 1 drives-worth, for parity). Similarly, a 12 drive RAID5 composed of twelve 1TB drives will provide a user storage area of 11TB (again, 1 drive-worth of space will be used for parity). Where n= the number of hard drives in the RAID 5 array. This of course assumes that they are all the same size, which in all but exceptional cases they are. Where drives of differing sizes are used the controller will assume that each is the size of the smallest. It is also worth bearing in mind that while the RAID 5 diagram shown earlier shows all the parity stripes on the same drive, in fact manufacturers tend to distribute the parity stripes across all the members of the array, different RAID controllers and manufacturers will distribute the parity in their own idiosyncratic ways but always – for each row of stripes across the hard drives in the array, one will be parity and all the others in the row will be user data. What about other forms of Implementation? Similar to RAID 5 but the parity stripe for each row is always on the same drive- in other words all of the parity information is stored on the same physical disk (in fact the simplified illustration shown earlier to demonstrate RAID 5 could be the start of a RAID4 array). Each row has 2 parity stripes (i.e. user data storage space is n-2), this means that 2 drives can fail and the data can still be reconstructed. 2 pairs of drives, each pair has data striped across it (RAID0) but each pair is mirrored (RAID 1), this does benefit access speeds and provides excellent redundancy but in practice is complicated to configure and maintain. We hope you found benefit in our starter guide – if there are any areas you’d like us to expand on, just drop us a comment.